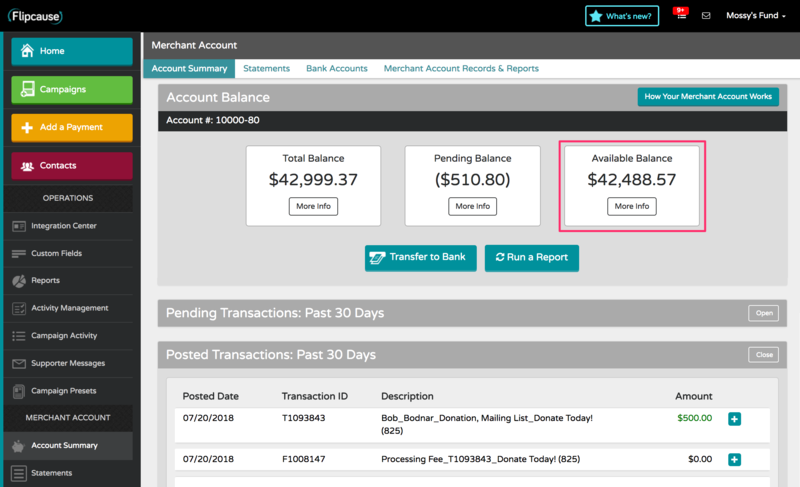 Your Account Summary will give you an overview of your Available Balance, any Pending Balance, and the Total Balance that is available to you in your account. You can click “View Details” on each one of these sections to get more detailed information. The “Available Balance” is the amount of funds in your Flipcause account that you are able to transfer to your bank account. The “Pending Balance” is the amount of funds in your Flipcause account that is pending approval from our Verification Department. Transactions of $5,000.00 and above will automatically be flagged for verification, and will take 2-3 business days for approval. The “Total Balance” is the available balance plus the pending balance. There are no fees to make a transfer from your Flipcause account - 100% of the funds you see labeled "available" belongs to your organization.